What are you planning to do this coming long Memorial Day weekend? If you are going to fire up your grill and invite friends and family for some BBQ, may I suggest you to include this healthy and delicious salad on your menu? Loaded with healthy ingredients, such as quinoa, avocado and radishes, this salad is so flavorful and bright. 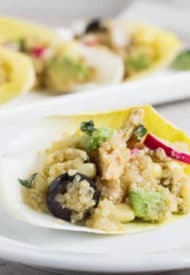 Chicken, marinated in honey Dijon dressing, and quinoa, cooked in seasoned chicken broth, are main ingredients of this salad. Crispy radishes and endive leaves give the salad perfect texture and crunch! The great thing about this salad is that you can prepare everything a day ahead and just toss everything before your guests show up. You will need to marinate the chicken breast in honey Dijon dressing for about 30 minutes. (I used Saucy Mama’s Honey Dijon dressing I talked about here and here.) Then you cook the chicken and shred it into small pieces either by fork or in the food processor. It’s important to cook the quinoa in a well-seasoned broth loaded with your favorite herbs and seasoning. I used basil here, but feel free to add whatever you like. 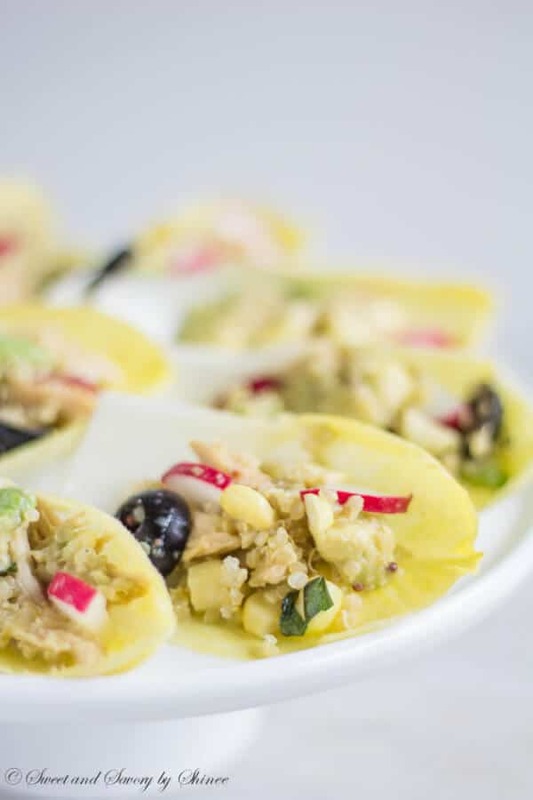 Did I mention these salad boats have beautiful presentation and easy to serve? It’s also a great light dinner on hot days, when you just don’t feel like eating a heavy meal. 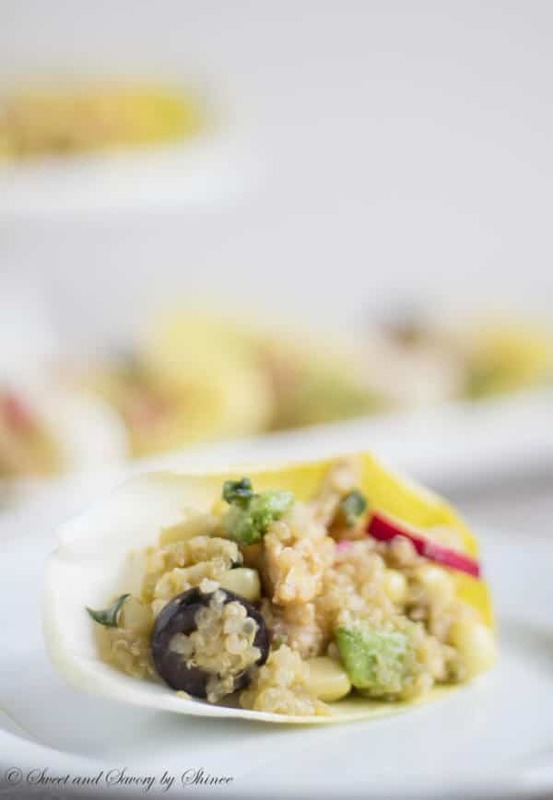 This loaded honey Dijon chicken quinoa salad is not only healthy and full of flavor, but also beautiful and convenient to serve at any summer BBQ parties. 1. In a medium pan, coat the chicken breast with ½ cup of honey Dijon dressing. Let it marinate for 30 minutes. 2. In a small saucepan, bring the chicken broth to boil over medium high heat. Add quinoa, basil and lemon juice. Reduce the heat to medium and simmer for about 15 minutes, or until the broth is soaked up. Fluff the quinoa and let it cool. 3. In a medium frying pan, heat olive oil over medium high heat. Put the marinated chicken breast and cook from both sides for 15-20 minutes. Remove from heat. 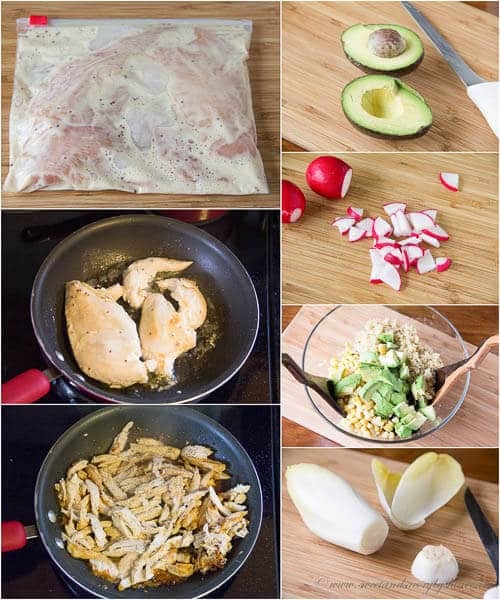 Shred the cooked chicken and put it back into the pan. Add about 2 tablespoons of remaining honey Dijon dressing and mix together. 4. Cut the avocado into small cubes. Slice the radishes and black olives as well. 5. 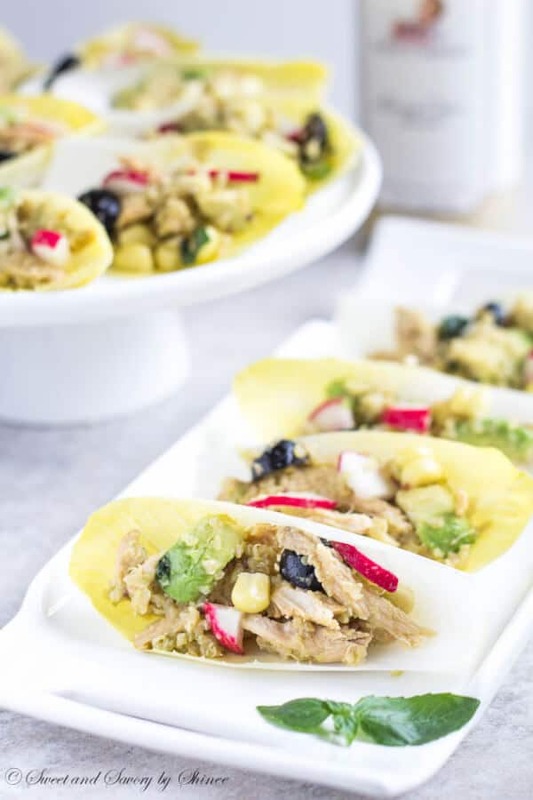 In a large bowl, mix together quinoa, shredded chicken, avocado, radishes, black olives and corn. Add the remaining ¼ cup of honey Dijon dressing. 6. Cut the end of endives and place the leaves on a platter. 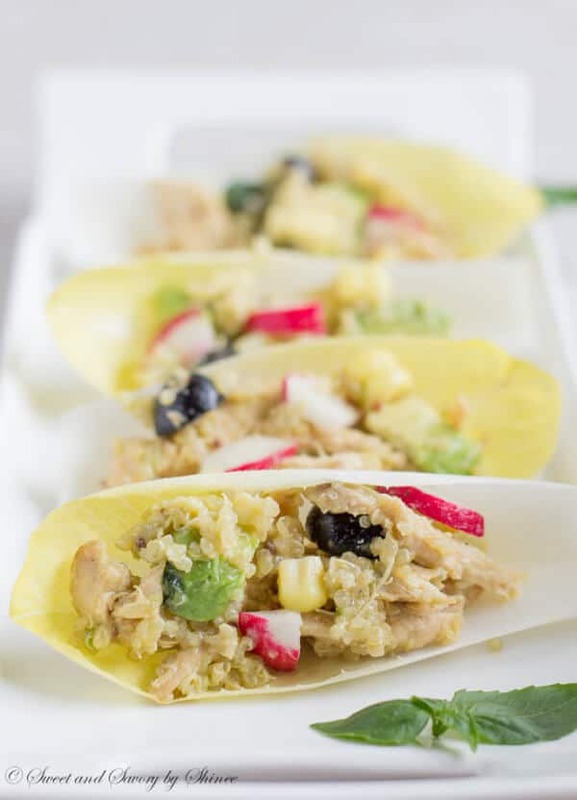 Fill the endive cups with chicken quinoa salad.